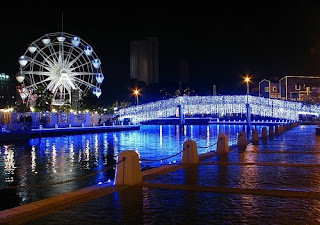 Once dubbed ‘Venice of the East’ by European seafarers back in those days when the state has yet to be formed, Melaka River is the point where the history of the great empire of the Malay peninsular, Melaka began. 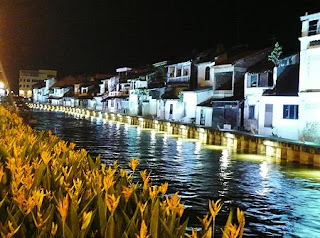 A Prince from Sumatra, Parameswara (the founder of Melaka) had established his sultanate near the mouth of this river in the early 1400s, and his palace was built on the east-bank of the river at the foot of St. Paul’s Hill, then known as Melaka Hill. Heading towards the sea, the river passes through the town of Melaka and the many settlements situated along the riverbanks. From a place where major trade and commerce activities used to take place, it is now a major tourist attraction, a remnant from Melaka’s past left behind to tell the tale. A 45-minute cruise down the river via boat enables visitors to recall Melaka’s history while enjoying the rustic scene of leftovers from Melaka’s past. Covering a distance of 10 kilometres, the boat ride takes you all the way down to the infamous Kampung Morten. Starting from Dutch Square, the first lesson in history starts at the Melaka Bridge, otherwise known as Tan Boon Seng bridge. One could imagine the importance of this bridge back in those days, as the Portuguese had used the bridge as a means to capture the state by seizing it, cutting all communications from the left and right side of the river, dividing Melaka into two parts. Right after the Melaka Bridge is the Chan Boon Cheng bridge. Replaced by a concrete structure in 1963 as what is seen today, the bridge was originally a steel construction built in the early 20th century linking the old quarters of Chinatown (then known as ‘Kampung Pantai’) on the west side of the riverbank to the new quarters of Chinatown via Jalan Bunga Raya on the east side. This bridge has a gruesome history, during the Japanese occupation, it was said that the Japanese soldiers had placed the beheaded heads of their victims at the foot of the bridge as a not-so-gentle reminder to the locals not to toe the line. After the Chan Boon Cheng Bridge, one will pass a pedestrian bridge called ‘Ghostbridge of Melaka’, which links Kampung Pantai to Kampung Jawa. It is not known whether the bridge’s name has got anything to do with anything supernatural; it remains a mystery to this day. Further down the river is another foot bridge, the Old Market bridge, which links Kampung Hulu to Jalan Kee Ann and the old Central Market. A picturesque scene of fishing boats berthed along the riverbank used to grace this area once upon a time ago, where they unload their catches to be sold in the market. Now, they are populated by a row of restaurants serving mainly Chinese cuisine, including a particular eatery which had been featured in the Hollywood blockbuster ‘Entrapment’. Not far from the place where Central Market used to reside is the Jalan Hang Tuah bridge, which links Jalan Munshi Abdullah to Jalan Hang Tuah. On the right side of the riverbank, the now-closed Cathay Cinema can be seen, while on the left side of the riverbank is Jalan Kilang, which used to be one of the liveliest, most bustling areas in Melaka, what with its vital role as the Express Bus Terminal back then. Rows of old shophouses can be seen lining the now-quiet street. The boat cruise’s last destination is the well-known Kampung Morten, an old local settlement. Classified as a national heritage site, this typical Malay village is widely-recognised as a living museum with its well-preserved traditional Malay architecture and charming age-old culture and lifestyle unaffected by the passing of time. Just before Kampung Morten, the ruins of Church of Rosario can be seen on the right side of the river.